Remembering and affirming the life of a loved one is an important part of the grief process for many families. Our Senior Co-Ministers, Rev. Teresa Schwartz and Rev. David Schwartz, usually conduct Memorial Services, Funerals and Committal Services. 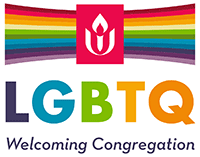 They welcome the participation of other clergy, family members and friends in the service. They will meet with the family and help the family create a meaningful service. 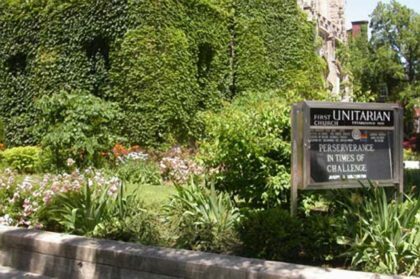 Our main sanctuary and Hull Chapel provide a gracious setting, and our organist and pianist, will work with the minister and you to help create a meaningful memorial service. Hull Chapel will provide a pleasant, warm setting for a reception following the service. Our rates for Memorial Services are $750. For fees for our Senior Minister, our pianist/organist, and our Custodian’s services, Please contact our administrator at (773)324-4100, or via e-mail at office@firstuchicago.org. Built in the early 1930s, the church is a Gothic structure of pure masonry construction, made to stand, like the Old World churches, for hundreds of years. Although the building is not large, its unusual height gives a sense of unbounded space and upward thrust. 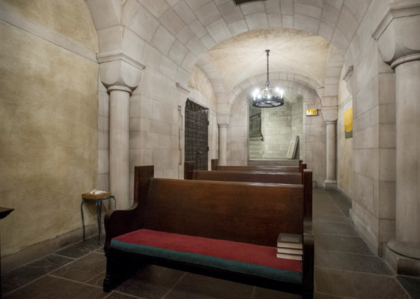 From its very beginning, the Crypt was designed not just for the church, but as a public, neighborhood institution. 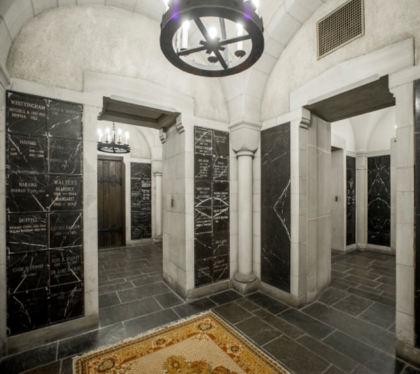 The Crypt space is lined with natural stone niches for the deposition/ interment of cinerary urns (also called a columbarium). After deposition of urns, the niches are closed by beautifully veined black marble panels. Niches 11 to 18 inches in depth suffice to hold urns for members of an entire family. Inscriptions of names and dates may be cut directly into the marble facing of each niche. Thus, the ashes of the dead may be buried, not in some distant and easily forgotten place, but in the midst of the city where their names and lives may be more frequently recalled to the great benefit of their friends and heirs. Church and Crypt may be visited daily through the church office, and the Crypt Chapel is a serene place of loveliness and unbroken quiet. Space in this Crypt is comparably priced to other facilities such as columbaria or ground plots in cemeteries and is priced well below the costs of mausoleum vaults. In addition, some costs, for example, tombstones/ markers, protective boxes of cement or copper, cosmetology and embalming, and of transportation of the deceased, can be avoided. Neither a commercial mausoleum, lacking the more profound associations of a house of worship, nor a remote place apart from the vital movement of life, the Crypt is part and parcel of an actual church where public services are held and the ever renewing ideals of living religion perpetuated. It is close to the scene of active affairs, accessible and near, yet a sanctuary of quietness and peace beyond the clamor of common life. Here, in the very midst of the hurry of the modern city one can be in touch with the stories of the past that are yet linked with the ever developing future. Here the personal memorials of many citizens will join together. Here, also, that Church will lengthen the influence of all those persons whose deeds and memories have been entrusted to its abiding care. The Crypt and Chapel are not wheelchair accessible. Single niches, depending on size,and location, start at $975, with additional cost for lettering by a professional stonecutter. Fees and further details are available from the church office.